My Sales Assassin methodology reinforces that the demand for products, services and revenue drives the success of business performance. A Sales Assassin team of professionals knows they will either lead or get out of the way of progress – and get out of the organization. When they lead, there is outrageous potential for success. The word outrageous must be seen as a mandate for an aggressive approach. The organization must learn that failure to meet goals is not about the loss of the individual big sales opportunity, but instead it’s about loss and misuse of all the resources that it took to get us to this place and time – misuse of manufacturing and engineering efforts, misuse and cost of inventory left in the warehouse. rather than how it hopes and prays it will perform. Focus on your goals: find out where your motivation lies and keep it real with yourself! If your passion truly is your product and you believe it is the best most beneficial product or service for businesses or consumers, then your prospects will hear that passion, confidence and sincerity in your presentation. Quantify all of your goals with measures that make sense to you in terms of weeks, months or a year — small chunks that you can see, touch and feel. Post these numbers where you will see them several times each day. Write out the reward you will earn from the company and those that you are going to give yourself – small rewards for weekly goals and larger rewards for meeting monthly and yearly goals. Post or store your goals in a place where you can see and track your progress toward your goals daily, weekly and monthly. A Sales Assassin must have outrageous passion, dedication and courage. 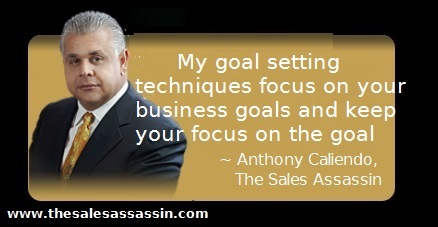 My sales goal setting techniques focus everything in terms of your business goals and keeps your focus on the goal. This is mental conditioning.